How about if we get back to our regularly scheduled programming with a much delayed review of Daredevil #3? I won’t bother with a spoiler warning since I assume that people are either trade-waiting (and not reading individual reviews) or have already read this issue which came out last week. There are plenty of surprises this issue, including an ominous cliff-hanger, the return of an old friend, and an encounter with a new and improved villain. Taking old villains and giving them something of a makeover has been a successful, recurring feature of Waid’s run so far, and that streak continues here. While the Owl is a far cry from some of the more pathetic members of Daredevil’s rogues gallery, and has often been a credible threat, he does have a somewhat ridiculous gimmick. 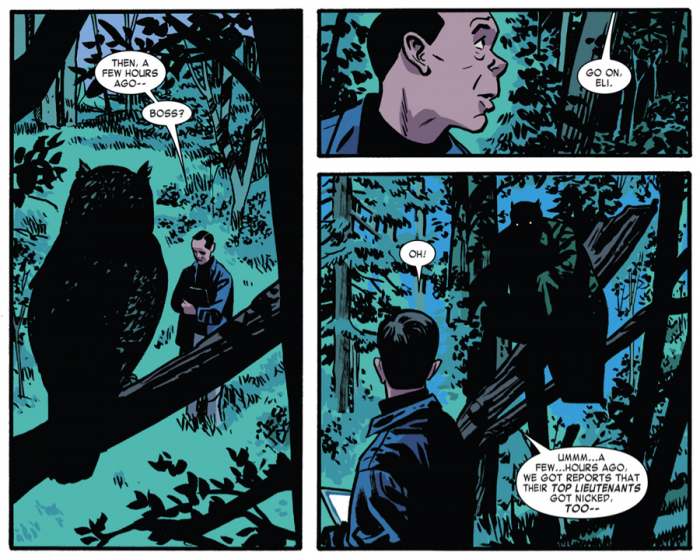 In the opening scene of this issue, Waid and Samnee manage to create a whole new kind of mystique around the Owl, and the result is quite eerie. I don’t have enough good things to say about Samnee’s fantastic handling of the Owl’s reintroduction to Daredevil’s world. While the comic book craft is sometimes compared to cinematography, it’s scenes like this one that makes you appreciate the kind of skill it takes to bridge the actual differences between the two. In a series of static panels, Samnee successfully gives the opening sequence a real horror movie feel. The Owl is partially obscured by darkness, nearby is a real owl which cleverly confuses the reader, and the hapless goon at the center is seen moving desperately in search of the owner of the voice which appears to be reaching him from several different directions. There is a real sense of a camera moving through the scene, along with the subjects on the page, and it’s amazingly well done. In another part of town, Daredevil is trying to hold his own on the Shroud’s turf. 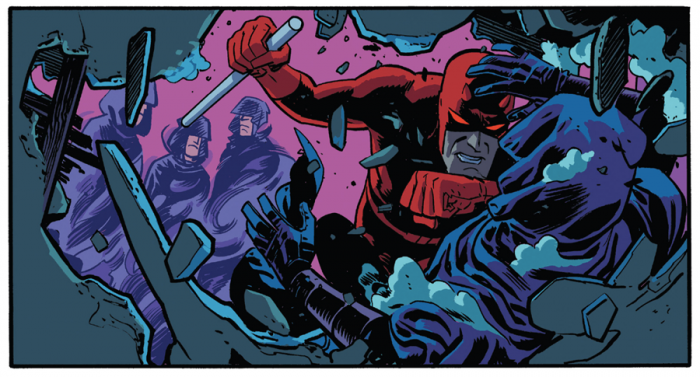 This is another case of great choreography on Samnee’s part and colourist Javier Rodríguez does a great job of making Daredevil stand out a bright speck of red against the the bluish shades of the Shroud and the background. The encounter between the two has just the right amount of humor and, due to the Shroud being obviously unhinged, it neatly avoids the most common hero versus hero cliches. It is also nice to see their respective powers being used as cleverly as they are in this scene. Kudos also to Mark Waid for, once again, having Daredevil’s unfamiliarity with his surroundings work against him. There really is a lot of truth to the notion of attention being a limited neural resource (my biggest pet peeve during Bendis’ otherwise great run was his tendency to portray Matt as capable of being simultaneously aware of an almost limitless number of things). In San Francisco, sorting the signal from the noise, so to speak, would logically be more difficult than in New York where the “noise” is familiar. In what has become standard Murdock fashion, a plan is put into action that sees Matt being both savvy, bold and, in the end, over-confident. It’s interesting to see the new status quo, with the public – villains included – being aware of Daredevil’s true identity, and his two roles becoming much more fluid. Foggy is alive! Okay, so we probably new about that part but, hey, Foggy is back! It’s been teased that we will find out shortly how the current plan to keep Foggy hidden came about, but for the time being it’s a relief just to see him back and clearly not on the brink of death. While I can imagine some readers reacting to the undeniable slapstick nature of Foggy’s reappearance, it definitely put a smile on my face. As did Kirsten’s reaction. Not much to say about the cliff-hanger except that it’s always interesting to see how Matt gets himself out of these little jams he finds himself in. I’ve come to expect something clever and all around spectacular from this team. Daredevil #3 was a great issue, with excellent pacing and a wonderful balance of horror, action, humor and suspense. What more could you ask for? Spectacular art? It clearly had that too, in spades. I’m very much looking forward to seeing where we’ll go next! Counting down the days to #4! Overall a solid issue. Loved the last page. Two things that kinda brought the issue down a little for me. The Owl. I really liked the way he was written. I hated the way he looked. Something was just “off” about the way Samnee drew him. It reminded me of the weird way Rodriguez drew Dr. Strange. It was almost like they’d never seen the characters before and based their illustrations on someone else’s descriptions of the character. The humor. 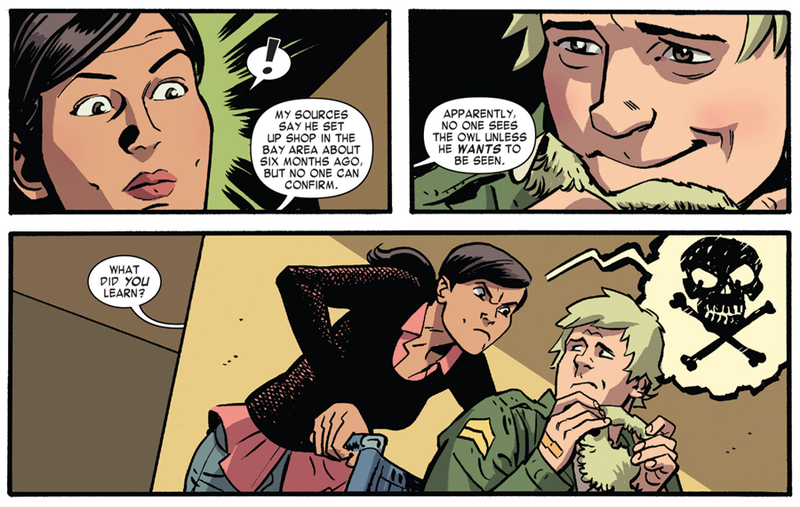 I know I’m in the minority on this, but almost every time Waid goes for a laugh involving Kirsten or Foggy it just falls completely flat for me. Its like reading an Archie comic instead of Daredevil. I know Waid’s whole point is to make the book more fun and less doom and gloom, but over the last year he’s really started to swing that pendulum too far the other way. And just to be clear, i know humor is very subjective, and I love humor in my comics. My other two favorite books are X-Factor and More Than Meets the Eye, both of which I laugh out loud while reading, causing my wife (who loves Waid’s DD also) to give me funny looks. For the last year I’ve been rolling my eyes at the humor in DD and just slog through those scenes to get back to the drama and intrigue. I’m very much interested in where this is going. Also, I still just really like this creative team. Also also, Foggy and Kirsten are precious. Reading this book is what driving a top of the line luxury car must feel like: touch the accelerator and it leaps to life, a gentle turn of the wheel handles the nastiest corners, and the engine never rises above a purr, no matter how fast you drive. This is another satisfying issue. While the Owl has always seemed to me like a lame-o, I’m more than willing to give Waid and Samnee space to work their magic. Maybe he’s involved in something with SF’s tech scene? While there aren’t any hints about that, lord knows it would be timely given SF’s white hot tech sector. Personally, I hope the Shroud becomes a regular in the book. DD doesn’t have much of a supporting cast right now beyond his GF/law partner, the deputy mayor, and a not-dead Foggy Nelson. How many times has that guy been declared dead? Three? He’s getting Jean Grey-like powers of resurrection. Love the mention of an Owl fight w/ Alpha Flight. Hahaha. That must have been an comically bad super hero comic. Great issue! Finally got around to reading it. The Owl was done well here, particularly the opening park scene. After what Bendis and Brubaker did with him he really should get more respect. Although I hope at some point they mention how the Owl bounced back from having all of his tendons snapped, just seems like a hard thing to recover from. Also the lying cat reference was AWESOME!! If your not reading Brian K. Vaughan’s Saga title you need to start, its one of the best titles out there right now! Just a solid issue looking forward to more. The new status quo of Matt’s identity and powers being known is especially interesting. It would seem that someone like the Owl would be able to plan for Matt much better now and have some sort of radar chaff or sonic emitter on hand at all times now. I mean things should really get harder that not only his identity is publicly known but also the exact nature of his abilities. Loved the humor with Foggy but I kind of feel bad for him being locked away while Matt and the others get to live full lives. The other thing that kind of popped out at me this issue was the use of smart phones. I think you might have covered this in an older post Christine, but It would seem smart phones would be difficult for the blind to use because it is so reliant on being able to see and manipulate a flat screen. I guess everything would have to be done through voice commands and a talking/audio feature on the phone. Just another example of modern technology making life more difficult for Matt. Also just to throw this out there, but is anybody else missing Becky Blake and Dakota North? For some reason I thought about them while reading this issue, and I know they left on bad terms after Shadowland but it seems a little odd that they wouldn’t have shown up through all the hardships that Foggy has been facing. Maybe its just the fact that DD’s supporting cast needs a little cushioning at the moment, but im sure that will change as Matt gets more settled in SF (and DD’s supporting cast has always been pretty small). And just a little food for thought. Its seems with Matt in SF, the return of the Owl and the regular inclusion of the Deputy Mayor that Waid is slowly pushing the title toward the future that was seen in DD 1.50. Is this a good thing or a bad thing? I really miss Dakota. She was one the best things about Brubaker and Diggle’s runs. I’m paraphrasing Brubaker from an interview, “Dakota was the perfect woman for Matt Murdock, they just met at the worst possible time in their lives.” I’d love for her to show back up down the road sometime. She’s a 1000x better match for Matt than almost any of his other love interests, besides Karen. I love some of the smaller details in this issue involving the relationship between Kirsten and Matt. When he’s calling her and her phone’s caller ID comes up with a picture of Matt and the caption “Not Daredevil” it refers back to their game of you are/I’m not – has she not reprogrammed that, or is part of the on-going banter between them? It’s certainly not for Matt’s benefit as he would be entirely unable to see that screen. There’s also the ever-changing sign on the door of the offices. “Matt Murdock” in tiny letters is one thing, calling him “Magoo” is another… unless it was Matt who had the sign changed? We aren’t told. There’s clearly some snarky back-and-forth continuing between them. There’s also that bit, during the same phone call, when Matt tells an off-screen Shroud “You go shower. Now.” Poor Matt – given the squalor Shroud has been living in I can’t imagine he smells good to us normals, much less Matt. Given that, Matt’s terse command is quite restrained. Reminds of the bit in the Netflix show where he’s confronting a junkie with visibly rotting teeth who allegedly smokes menthol cigarettes to hide the stench. Matt’s clenched teeth when he says “It doesn’t” really drives it home and I got that same vibe here. I’ve lived in a big city, alley’s stink, train stations stink, homeless people stink, a lot of non-homeless people stink… and my nose is not the most sensitive. No wonder Matt hates crowds and gets cranky. Also liked the bit where Matt’s cane is being confiscated – yes, he’s blind, but because he’s fully out of the closet now he will be cut less slack even when in a business suit instead of a red longjohns. I wonder if Foggy is going to wind up being the one with the secret identity and he’ll get a taste of what Matt had to deal with for several decades?